Bruno Fattorini, as designer and art director guided the company’s aesthetic, cultural research and philosophy. He had the determination to develop products towards precise life styles, interpreted with simplicity with the change of the millennium; these affected the whole MDF Italia furniture collection reinforcing its strong identity. Allen 2 Sofa available in numerous lengths and as a dormeuse, pouf, corner, or extra large unit. Sliding Sofa comes in a a version with electrically controlled height-adjustable backrest and manual tilting cushion. 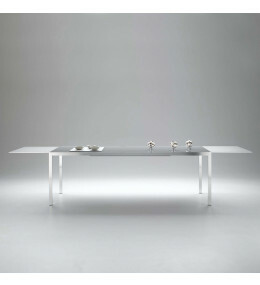 Extension T Table can be made up to 110cm longer to comfortably accommodate up to 4 extra people. 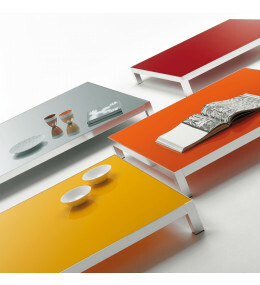 Colors Coffee Tables is a family of low tables characterised by the chromatic continuity of top and frame. 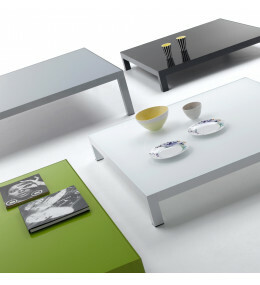 Lim 04 Coffee Table has built-in tops available in 7 finishes. Anodized versions suitable for outdoors use. Fattorini Sideboard offers a high-end finish of natural anodized aluminium, gloss or lacquer.